Scavenging is the process of removing burnt exhaust gases from the combustion chamber of the engine cylinder. Scavenging is the most important process in automobile engineering. If the burnt exhaust gases, in an Internal Combustion Engine (whether it works on spark ignition or compression ignition principle), are made to remain inside the cylinder. These burnt gases would mix up with the fresh incoming charge thus diluting latter and reducing its strength. In four-stroke cycle engine, the piston, during its exhaust stroke pushes the burnt gases into the exhaust manifold to escape to atmosphere through an exhaust valve. But in two-stroke cycle engine, a blast of fresh charge is made to enter at a higher velocity into the combustion chamber at the end of working stroke of the piston and thus drives out the burnt exhaust gases. 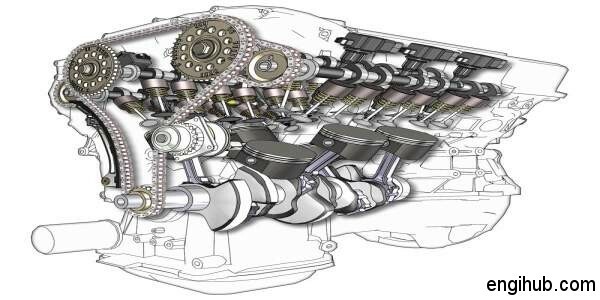 Here you will find detail about different scavenging methods used in an engine. In the case of two-stroke spark ignition engine, there is a possibility of the fresh charge escaping out with the burnt exhaust gases because there is a small fraction of a revolution of the crank during which the exhaust of the burnt gases and the entry of the fresh charge is taking place simultaneously. To overcome this difficulty, the piston crown is manufactured in a particular shape. So, the fresh charge is deflected upward after entering the cylinder. In this method, the inlet or transfer ports are situated on one side of the cylinder. While exhaust ports are situated on the opposite side. The piston crown is designed to a particular shape. Hence the fresh charge is deflected upward to push out the burnt exhaust gases. In this method, the inlet and exhaust ports are situated on the same side of the cylinder. A loop is formed as the fresh charge of air-fuel mixture or pure air enters the cylinder. This loop will push out the burnt exhaust gases. In this method, both the fresh charge and the burnt exhaust gases move in the same upward direction in the cylinder. The valve closes, as the piston moves upward during the compression stroke. A fresh charge is supplied from the side of the cylinder. Sometimes a separate compressor is provided to compress the charge for being subsequently supplied to the combustion chamber. The compressor may be driven by engine crankshaft or by an external power. In this method, the charge is previously compressed by the other side of the piston. This is done by sliding on the other side of the cylinder. This is also closed. It has a suction valve to admit the fresh charge. The partially compressed charge is then supplied to the combustion chamber as usual.